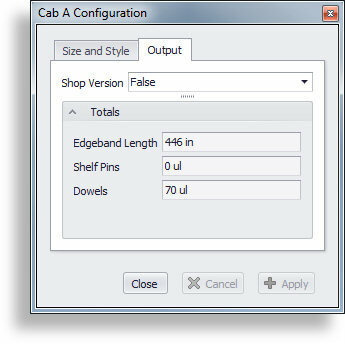 Can your configurators handle edge banding? I’ve been asked that question several times as of late, and have done a good deal of modeling and code writing related to edge banding, so I put out this post with its accompanying video to answer the questions for others who have concerns related to edge banding. The Shop Version True/False control shown on the form to the right controls whether edge banding is shown on the model. As of this writing, this control is not on the form of any of the configurator you will find in the Members area. It is added when you create the functionality yourself, and is a simple drag and drop of the parameter in the form editor. Edge Banding control is just one of the nearly limitless possibilities a cabinet shop has at its disposal by using iLogic and advanced modeling techniques. Our Configurator Packages supply the raw models and base code, and the tutorials available to members are continuously added upon to help teach our members how to add automation to their version of our configurators in whatever way they see fit.